BANGI, 26 June 2012 – New discoveries and innovations in the medical field requires those wanting to become doctors needed to be prepared for lifelong learning. Former Prime Minister, Tun Dr Mahathir Mohamad himself a medical doctor said because of research, what is unimaginable today will be common practice in the future. Speaking to mostly medical students in a ‘meet Tun Dr Mahathir’ session at The National University of Malaysia Medical Centre (UKMMC) here today, he said during his time as a doctor organ transplants like heart and bypass surgeries were not possible but with research and innovations they have become common. More things which are unimaginable today will be possible in the future, he said. Doctors, he said, are trained to diagnose a medical problem and then look for the most effective treatment. During his tenure as the Prime Minister, he had used the same diagnostic and treatment method for example to get the country out of the Asia financial crisis. So the same method can also be used to solving problems that arise in society since diseases are not limited to the human body only but also inflict society. Dr Mahathir said doctors should use their skills beyond the medical field because they possess the ability that can benefit society at large in ways that some cannot even imagine. What needs to be done is to identify the problem and ask what is the real problem or whether there are other underlying factors. Only then can the right solution to a problem or issue be found. But if their diagnosis is wrong, no matter how good the treatment is, it will not solve the problem. 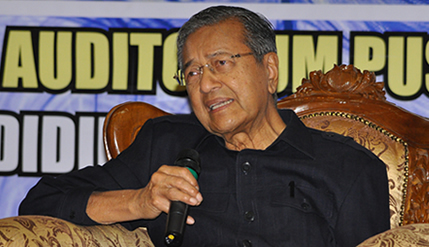 Having this ‘diagnosis and treatment’ thinking enables a person who is trained medically to see a problem differently than others as it would allow him to be focused on dissecting the problem and choosing the right solution, Dr Mahathir said. He urged medical students to choose the profession for the right reasons for the job satisfaction. Pay and remuneration should come after that. No price tag can match the satisfaction of saving a patient’s life in the middle of the night. Dr Mahathir said doctors could not clock in or clock out according to office hours as their services are needed 24 hours a day. A doctor is always on call. Present at the talk was Dean of the Medical Faculty, Dato Raymond Azman Ali; Director General of JASA, Dato’ Fuad Hassan; former information Minister, Tan Sri Zainuddin Maidin and Tan Sri Musa Hassan Former Inspector General of Police, students and medical practitioners.